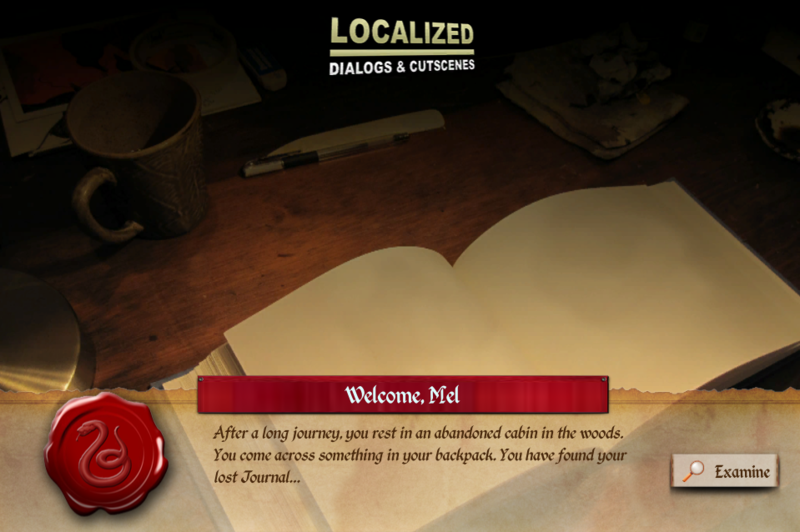 An amazingly intuitive HD Cutscene and Dialog UI System! 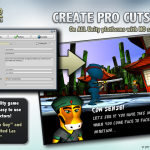 Using easy custom editors, this industry proven framework can effortlessly create powerful localized UIs for cutscene-style dialogs, visual novels, user prompts, passwords and more! Automatically translate your dialogs into 9 languages with a single click! Work in teams with Google Spreadsheets! Build once, deploy anywhere! Works on Desktop, Web and Mobile with resolution independance! Now supports other 3rd Party Tools! LDC is now written in C#! Single package supports Unity 5.6x -> Unity 2019.x ! Render GUI to the screen or to a material! World Space GUI mode supports VR! Create powerful Dialogs with NO scripting! Create 2D animations for Icons, Actors and Backgrounds! Icon Grids – Great for merchant screens, level selects, inventories and more! 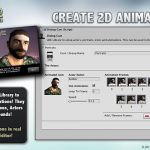 Create animations for Actors, Portraits, Backgrounds and buttons! Transitions with alpha fades and motion! In and Out Screen Transition Effects! Automatically translate your dialogs into 6 languages with a single click! Visually script navigation with logic screens! $Tokens! Custom variable system with built-in actions! @Styles! Custom rich text and effects markup language! @Keywords! Cadence, typewriter and scrolling settings! Actions to create, edit and delete PlayerPrefs! Powerful File Management to automatically save, load and delete tokens and PlayerPrefs! Intuitive image and animation libraries! Audio system with built-in Actions to play, stream, and fade audio! Fine control for all UI motion, fades, etc! Easily modify UI themes with Unity GUISkins! 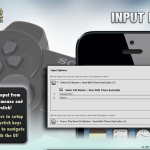 UI supports Touch, Keyboard, mouse and even joypad input! Work in teams to create / update dialogs with Google Spreadsheets! 20 Playable Demos & detailed PDF Manual! FULL source code included (No DLLs)! Requirements – LDC requires Unity 5.6 or higher. Supports World Space & VR! Full Source, Docs & Demos! 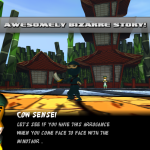 Commercial games such as “Ninja Guy” by Immunity Studios used an early version of LDC for their in-game cutscenes! Now you can too! 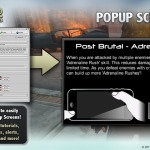 Create Amazing Cutscenes with customized dialogs, actors and backgrounds! Modify the UI, apply motion, fades and actions, all without a single line of code! NOTE: Graphics not included in plugin, content based on Warhammer 40,000 universe © Games Workshop. LDC can be used in many ways, you don’t have to use it purely for cutscenes! You can overlay it to your real time 3D game world to interact with objects and characters! Click on the links below to see LIVE demos of LDC in action! The Unity Webplayer is required! See how LDC can generate entire visual novels, complete with motion, transtions, soundtracks and more! .. All without a single line of code! This is created with the Unity WebGL Exporter. Please note that this is NOT included in the LDC download package. See how LDC can be used to interact with objects and characters inside of a LIVE 3D world! 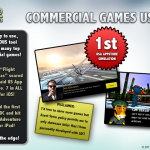 This demo project is created with the Unity Web Player and is included in the LDC download package. See how LDC can be completely reskinned to create immersive adventure experiences! This demo was created with the (now deprecated) Unity Flash Exporter and is included in the LDC download package. Video 1 of 3. Find out about all the new v2 features of LDC! Tokens, Actor and Background Layers, Multiple button dialogs, actions and more! Video 2 of 3. 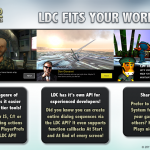 Find out about all the new v2 features of LDC! Tokens, Actor and Background Layers, Multiple button dialogs, actions and more! LDC Intermediate – Part 3 Video 3 of 3. Find out about all the new v2 features of LDC! Tokens, Actor and Background Layers, Multiple button dialogs, actions and more! Find out how to work in teams and use Google Spreadsheets to create and update LDC Dialogs! NOTE: Since the last video, there have been many new features and improvements to LDC! Keep an eye on whats new in the LDC Topic over at the Unity Forums! ALWAYS BACKUP YOUR PROJECTS BEFORE UPDATING! Make sure to read the “Legacy LDC Upgrade Guide” chapter in the documentation before upgrading from LDC v4.8.3 or earlier! World space GUI mode with support for VR! New variation styles for Data Entry & Password screens showing on-screen keyboard! Text Color bugs fixed in Title Dialog Screen. Auto-translate routines updated for newer unity versions. Icon Grid flickering scrollbars fixed in newer unity versions. Performance improvements in editor and at runtime. Contextual menu items for LDC. Custom Style colours should now fade in and out correctly. LDC is now completely written in C#. Google Spreadsheet Importer now works within a C# Project. All demos have also been rewritten in C#. Includes modified version of LDC v4.8.3 and a DialogScreen converter tool to help users upgrade. Logic operators may reset to “Equals” unless you follow the upgrade guide and use the converter tool. All scripts are now in the HellTap.LDC namespace. JS Function Array Callbacks have been removed from the API and replaced with UnityEvents. Logic screens now have new options! After a logic condition is passed, you can navigate to another screen directly, use a random range of screens or use a token to dynamically set the next screen! This multiplies the power of visual scripting within LDC as you can now use tokens to store screen ID’s as well as randomizing the flow of dialogs! Sliding your finger anywhere in the screen can scroll Popup Dialogs with manual scrolling. Icon Grid can now set if buttons that PASS logic conditions are disabled or visible (allowing you to create read-only lists). New Audio options in DialogUI. You can now force audio to end at the end of each screen and also fade audio out when a dialog ends. Dialogs can now be switched from Automatically Scrolling to manual scrolling when tapped / clicked. Option found in Settings > Text Effects. New API functions to change localizations. Now compatible with Unity 5.4.
uGUI Elements can be placed above LDC GUI (using “Screen Overlay – Camera”). Updates To RTVoice 3rd Party Actions. Popup Dialog Styles can now have custom size for buttons as well as custom button spacing. When adding AudioClips, the “Seconds To Show” option is automatically set based on the length of the clip. Icon Grid Buttons can now be easily re-ordered in the inspector. Icon Grid Titles and Labels can now have line breaks. Setting to stop speech audio if dialogs end early. Dialog Styles with custom font sizes are automatically doubled when using HD skins. BUGFIX: Fixed a bug in the Icon Grid which could cause errors when using logic to hide a button. BUGFIX: Fixed SendMessage action bug. You can now directly set the GameObject reference for SendMessages. LDC dialog text field in the inspector is now multiline. Title text using the ‘Title’ Dialog Style will now use the main text color set in the inspector. LDC Inspectors updated to be more stable and reliable in Unity 5.x. Completely new visual editor for DialogUI! Now every part of LDC has it’s own visual editor! Screen Transitions! 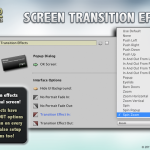 Choose from 18 transition effects and give each screen its own in and out screen transition! Default transitions can be setup in the DialogUI > Settings. API Updated To Support Screen Transitions. SendMessage can now send booleans as arguments. You can now use Debug.Log actions in your LDC screens at the start and end of each screen. Use this to get the status of tokens or any other custom message you’d like to print to the console! New Setting for how fast to fade the background UI when it is being hidden / shown. New option to only play an RT-Voice if no audio is setup on that particular screen. This allows you to use temporary Text to speech to test dialogs while you wait for voices to be recorded from your voice actors! Dynamic Dialogs demo updated to showcase different types of screen transitions! Simplified Chinese Translations for Next / Yes / No screens updated. BUGFIX: Fixed an issue where applying tokens using the API could use the wrong data if your tokens had similar names. BUGFIX: Fixed focus issues when changing tabs in the DialogOnGUI inspector. IMPORTANT: Existing Title styles may need to have their settings tweaked because of all the new options! The typewriter effect has been re-written and is now way more immersive with cadence features and live injectors (see below)! Use cadence tags to add timed Delays as well as modifying the speed of the typewriter at any point in your dialog text. Use cadence to better communicate emotion and enhance the narrative! Typewriter effects can now be set on a screen by screen basis! Create your own Text Styles to add cool features but without all the usual nasty code! It works just like tokens and doesn’t require any closing brackets! Set text color, size, boldness, italics, and even special cadence features like text delays and live typewriter speed changes when using typewriter effects! Easier to use than Unity’s built-in rich text markup with even more features like text color animations and live opacity balancing! Even better, you can now inject rich text into your dialogs while using the typewriter effect! It’s been a long time coming, it’s finally here! You can now optionally toggle scrolling text! You no longer have to worry about your text being too long in conversations! You can set the scrollable text to be either automatically scrolling or manually scrolling with a vertical scroll bar. Setup scrolling speed and scrollable footer spacing in DialogUI > Options! Scrollable text can be setup on a screen by screen basis! AutoScrolling now works on subtitle text so you can make really cool things like credits, scrolling story sections and more. 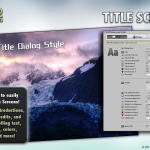 Override the default font and size of your Title screens on a per-screen basis! New controls over the text area size of both the title and subtitle. Text alignment can now be set independently on each title and subtitle. Finally, the typewriter effect can be toggled for the subtitle text on each screen. Options for hiding title and body text now apply to the Icon Grid styles. Setup voices for RT-Voice in DialogUI and easily play them in the actions tab in LDC! It’s super easy to use text-to-speech in your projects with LDC! Please note RT-Voice only supports Mac and Windows standalone builds. New section added to DialogUI for setting up third party plugins. You can setup RT-Voice profiles here! 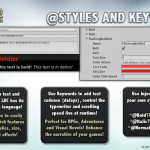 Have LDC inject rich text @Styles and $Tokens in your own strings! API_DialogCreate function can now take an extra string argument to allow for custom GameObject names. API for all relevant screens updated to use typewriter and scrolling overrides, as well as all the new features for Title screens! The Dynamic Dialogs demo has also been updated so it’s easy to learn how the API works! Fixed an issue that could cause custom button labels to not appear correctly! New Options to control the feedback from LDC via the console! Options to toggle system, action and logic console messages independently. Helps to debug your setup when you need it, and switch it off when you want an uncluttered console! Code enhancements to various styles. New routines should make it possible to add shadows to your title and body text regardless if you have custom backgrounds in your GUIStyles. Added some labels in DialogUI to better organise the dialog options. 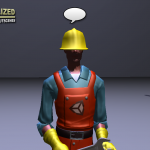 A full DialogUI custom inspector is planned for a future update soon! Fixed an issue where adding conditions to Icon Grids would cause the UI to become too wide. Two new demo projects! The credits screen demo, and a special demo showing how to use LDC’s text injectors outside of the system! Automatic Translations for Chinese, Korean and Japanese (note that Korean and Japanese translations are still in beta). New visual DialogLocalization Editor with new options! Languages can now be detected using the old system or using a custom PlayerPrefs string. Language settings can now be easily changed at runtime with visual actions in the inspector and via the API. GUISkins can also be automatically reloaded! Fixed issue when switching scenes too early, which could cause new dialogs to not show properly. Seamless Dialog Thread Navigation – you can now seamlessly change to any screen of any dialog without having to wait for LDC to fade in and out! This can be done using either an LDC prefab or finding another LDC Dialog in the scene by name. You can even choose the exact screen inside the new dialog thread to navigate to! LDC can now send Tokens as the string argument of Navigation Callbacks. Option to finish the Typewriter effect early when touching the screen or clicking mouse ( DialogUI > Options > Complete Typewriter Effect On Click Or Touch ). Set the fade in time of the background dialog graphics ( Dialog UI > Options > Background Fade Duration ). Performance Improvement in the Editor for large dialog threads ( LDC Also helps you to split up your dialog screens when they are getting too large )! Fixed 2 Button navigation callbacks always returning 0 as a button ID. Typewriter effect algorithm improved to be more consistent across all devices. NEW Icon Grid Dialog Style! Create a custom grid of icons (great for merchant screens, level selects, options and more!). Optimized the Popup Dialogs dialog style to run more efficiently. Set which layer LDC is being drawn to with GUI Depth options in DialogOnGUI > Options. LDC custom icon should show correctly in Unity 4.x inspector windows. Dropping an AudioClip into the Dialogs tab can automatically generate audio filepaths for audio streaming. Google Spreadsheet Features moved to “Third Party Extras” folder as an optional installation. DialogClasses script added to better organise the codebase. New DialogOnGUI Editor with GUI Scaling features. 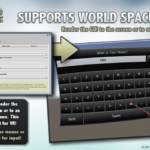 Use ‘Stretch To Fill’, ‘Scale To Fit’, and ‘Over Scale’ modes to render the LDC GUI. Minor fixes, including switching between tabs while focusing on previous elements. REBRANDING NOTE: Due to the fact that LDC’s copyright now belongs to Hell Tap Entertainment LTD, there has been some rebranding and renaming of folders. If you are updating LDC, keep an eye out on this as Unity often doesn’t correct things like that. You may need to rename any folder labeled “Black Zombie” to “Hell Tap Entertainment”. Easily import and update LDC Dialogs using online Google Spreadsheets. NEW Popup Dialog Style – Create custom popup messages with animated backgrounds and buttons. LDC GUI Abstraction – GUI part of code separated to allow for custom UI implementations in the future. Navigation Function callbacks – setup SendMessage when a user presses a button via the inspector! Demo scene included! Setup automatic GUI Skin switching between different platforms and builds. Focus GUI with Input Axes as well as Keycodes. Play Audio on button rollover and click. IMPORTANT: Extra conditions on Multiple Buttons had to be re-written to work correctly with Unity 4.5+. Updating to LDC 4.0 will delete any extra conditions you have created in your previous Multiple Button screens. Create Data Entry Dialog Screens via the API. Dynamic Dialogs demo updated to showcase new features of LDC 3.9. API has a new function to return the index of a Token by name -> API_GetTokenIndex( nameOfToken : String ) . FIX: Multiple Button screens created prior to version 3.8 are automatically fixed by the editor to work with the new version. ( NOTE: Select a dialog that has a Multiple Screen in the editor. If you see a “FIX” message in the console this will indicate that the editor has fixed any problems. If you are using a dialog saved as a prefab, make sure you click “Apply” to save the changes ). Add graphics and animations to buttons! New “Dialog Buttons” section added to the Dialog Library. You can now loop an AudioClip during the typewriter effect. Add a clip to DialogUI > Options > Play Typewriter Audio. – Tokens can now be applied directly into buttons. “Sort All Dialogs” now works on any dialog thread. LDC menu shortcuts are now organized in the GameObject > LDC submenu. Load / Restart Unity Scenes from Navigate tab. The Navigate tab can now Link different Dialogs together by using prefabs or playing existing dialogs in the scene. PlayMaker Actions! Separate package available (in ‘The LDC Demos & Extras/Third Party Extras/PlayMaker). Portraits can now be repositioned using GUISkins (Use ‘ContentOffset’ in the ‘Actor Portraits’ custom style). Buttons can now be repositioned using GUISkins (Use ‘ContentOffset’ in the new ‘Button Offset” custom style). 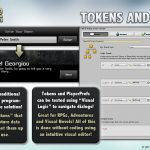 Logic Conditions can support keys from Unity’s PlayerPrefs as well as LDC Tokens! Create, Edit and Delete PlayerPrefs right inside of LDC, on a per screen basis! LDC Shows you a count of how many actions you are using across each tab, making it easier to keep track of things! – API updated to dynamically create Title Screens. API Supports function callbacks “At Start” and “At End” of every dynamic screen. API now supports hiding the background UI on each dynamically created Dialog Screen. – Updated API – Dynamic Dialogs Demo to showcase all the new features! Bugfix –Using Input keys would sometimes trigger actions twice. Automatic One-Click Translations! You can now automatically translate your Dialogs into Spanish, Italian, German, French, Portuguese and Russian with a single click! You can translate a single language per screen, all languages per screen, or ALL languages per Dialog Thread! NOTE: this feature will be available in LDC as long as Yandex provides the service without charge. Fixed bug with changing subtitle color in “Title” Dialogs. Fixed bug that caused localizations to be lost while “Sorting” dialogs from the Dialog Controller. Updated default Russian Skin to support Russian Header Text. UI is now focus enabled and fully supports the Keyboard and most joysticks via easy to use KeyCodes. New variables in DialogUI to setup KeyCodes (“selectGuiWithTheseKeycodes”, “focusNextGuiWithTheseKeycodes”, and “focusPreviousGuiWithTheseKeycodes”). New “Title” Dialog Style. Now you can easily create titles, intros, chapters and more! New Dialog option in navigation menu to hide the background UI strip. Allows for control on a per dialog basis. – Added gizmo icons to the LDC scripts. The “Multiple Buttons” Dialog Style now supports optional “Conditions” (each button tested against Token values). Choose between legacy / HD skins with “Skins > Use Hi Def Skins” in DialogUI. Actor Portraits are now customizable from the Dialog Skin (use Fixed Width / Height and Content Offsets!). You can now reposition and resize them. Portraits, Actor and Background Layers can now be animations. Live updating of animations in the inspectors. Animations are now setup in the Dialog Library (in Dialog Cast and Dialog Scenes). Notes feature added on all Dialog Screens. Easily keep track of long dialogs in every tab. New features and UI for GameObject Actions (SendMessage and de-activate being the most notable!). New DialogUI option to skip Next / One Button Dialogs using Input keys. [Fix] Screen duration now also applies to One Button Dialogs (as well as “Next” Dialogs). Fixed Russian and Portuguese localization options. Fixed Password Screen’s “Mask” option. Added Automatic File Management! You can easily save, load and delete your tokens into multiple save slots! New File Management Actions in the Tokens tab! New File Management API giving you full control! Full Flash support! LDC should now be fully compatible with Flash builds, as tested with Unity 4.1.2. Added new advanced functions to the API. You can now dynamically create entire Dialog threads completely via scripting. Tokens, Actions and localizations are not available via the API (although they can be implemented in script anyway!). Limited Support for Flash builds. Most things should work except for Token-based actions and related Dialog styles (eg Data Entry / Password screens). Added the “Logic” Dialog Style. This allows for an incredibly powerful way of using visual scripting to make on the fly navigation decisions. Using the built-in token system, you can compare tokens on the fly using localized values and allow the system to move to different screens! Added “Global Tokens”. Toggling this will keep your tokens in tact between scenes. NOTE: Make sure you have the same DialogUI prefab in each scene! Added icons to the Data Entry, Password, and Logic Dialog styles. – The dynamic formatting of numeric tokens is vastly improved. Added the “Password” Dialog Style. Compare data entry to a localized string or a token with 2 way navigation. 3rd Party Scripting API. LDC can now talk to and receive functions easily from other tools and scripts. – uSequencer Integration built-in. Setup and control your sequences directly from your Dialog Screens! New 3rd Party Actions tab added to support other plugins and tools in the future! 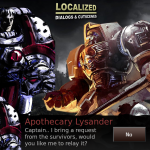 Localization component renamed to DialogLocalization to work better with other plugins. “Data Entry” Dialog Style for collecting user data and storing them into Tokens. Tokens – Variable like objects that can store data. Token API available to set / get tokens via script. 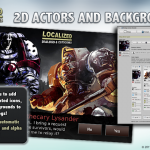 Background & Actor Layers – Easily create full screen comic / visual novel style cut scenes with ease! – Dialog Library – Centralize your images for the plugin and select them easily in Dialog Screens! New Actions for Background & Actor Layers, Custom Audio Channels and Tokens. Typewriter Text effect and more Dialog UI options. Various Editor Tweaks and Shortcuts. “Multiple Button” Dialog Style for vertically oriented multiple-choice screens! More Dialog UI options to independently hide different text elements. Dialog UI option to ignore screen durations, and force users to click “Next” or custom single buttons to progress. Selecting an actor from the cast also replaces the actor name field in the Dialog Screen, saving even more time. Adding a new Dialog Screen from the Dialog Controller now copies over the previous portrait and actor name. Various UI bug fixes and validation code. 0.75 seconds is now the default transition speed (25% faster than previous versions). This can be set back in DialogUI. “Dialog Cast” Feature and small updates to supporting editors. Standard Dialog variations implemented into the new “Dialog Styles” system. Custom Single and Two Button Dialog Styles. New Per-Screen transition and visibility options. New global options to control all motion, fades, shadows and more of the Dialog UI. Memory improvements in the OnGUI routine. First Commercial version of plugin. Are you ready to create amazing cutscenes, dialogs and story driven events in your Unity Projects? Buy the LDC plugin now!